The IMF discusses "The Good, the Bad and the Ugly: 100 Years of Dealing with Public Debt Overhangs," in Chapter 3 of its most recent World Economic Outlook. 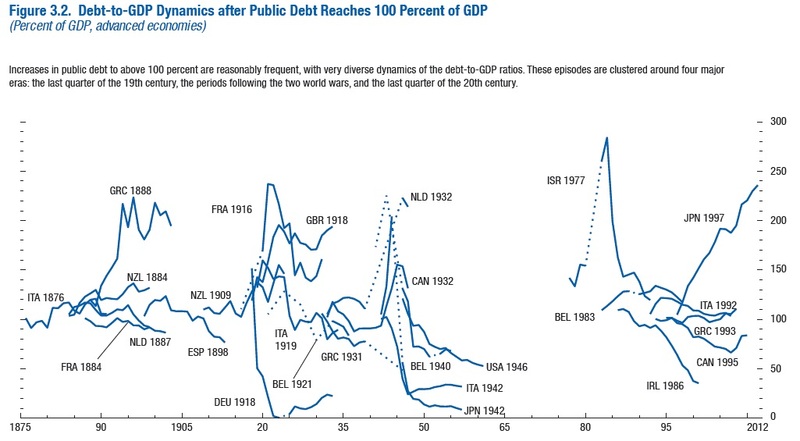 The IMF Fiscal Affairs Department has been compiling data on gross government debt-to-GDP ratios going back to 1875. This chapter focuses on the experience of the 22 advanced economies where there is good data over most of this period. What lessons can be drawn? For starters: "Public debt levels above 100 percent of GDP are not uncommon. Of the 22 advanced economies for which there is good data coverage, more than half experienced at least one high-debt episode between 1875 and 1997. Furthermore, several countries had multiple episodes: three for Belgium and Italy and two for Canada, France, Greece, the Netherlands, and New Zealand." Here's a figure showing the 26 episodes for these 22 countries where government debt exceeded the 100% level. One way to eyeball this chart is to draw a mental line horizontally at the 100% debt/GDP ratio. It becomes clear that the experiences here are very diverse: some of countries are on their way to taking on much more debt at this level, while others are about to reduce their debt dramatically. 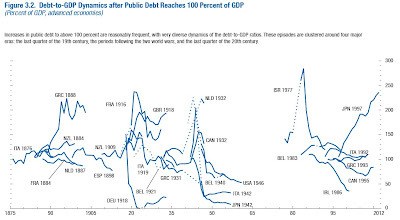 Another lesson that comes out of the figure is that the episodes of high government debt/GDP are essentially in four time periods: the last quarter of the 19th century, the years after World War I, the years after World War II, and the last few decades. But there are almost no examples of high government debt/GDP ratios in this group of advanced economies from the 1950s up through the early 1980s. Many of the episodes in which debt/GDP ratios decreased dramatically were in the aftermath of war--sometimes in accompaniment with hyperinflation after the war that ate away the value of the debt. Only three of these 26 debt overhang episodes ended in actual default: Germany (defaulted in 1932), and Greece (defaulted in 1894 and 1932). How does taking on a lot of debt affect economic growth? The IMF authors are suitably reticent here about any claims of causality. As they point out, high government debt might cause slower economic growth, but it's also plausible that slower economic growth makes a debt/GDP problem worse, by raising the desire of government to borrow in hard times while holding down the denominator of the debt/GDP ratio. (For an argument and some supporting evidence that the causality does run from higher government debt to slower growth, Carmen Reinhart, Vincent R. Reinhart, and Kenneth S. Rogoff make that case as part of their article in the Summer. 2012 issue of my own Journal of Economic Perspectives.) Thus, the IMF authors stick to looking at correlations, without making an argument about causality. One of those correlations struck me as especially interesting. When the separate cases where government debt was above 100% of GDP and rising from cases where debt is above 100% of GDP and falling, they find that growth performance is notably better in those cases where debt/GDP ratios are falling. In this sense, it's not just the high level of debt that's the problem, but whether the government is showing a clear ability to address the debt/GDP ratio. "The first key lesson is that a supportive monetary environment is a necessary condition for successful fiscal consolidation." In my own mind, one of the strongest arguments for the Federal Reserve promising to keep interest rates low for some years into to the future doesn't have anything to do with how it might influence current borrowing and demand; instead, it's because low interest rates help to reassure investors that the the large and growing U.S. government debt is affordable. If U.S. interest rates were to spike upward, paying the interest on the U.S. government debt could become much harder in a hurry. Of course, this insight also emphasizes that the Federal Reserve feels a need to facilitate the huge U.S. budget deficits--not because it favors the deficits, but because the alternative of not facilitating them could be worse. by a fiscal framework that supports the measures implemented." What the authors mean here is that when governments try to address their debt problems with nonspecific policies like across-the-board spending cuts or spending caps, they often are failing to make any actual real choices about what will change. The countries that have had some success in recent decades in reducing debt/GDP ratios--Belgium in the 1980s, Italy around 1992, Canada around 1995--succeeded because they made specific choices about reforming pensions, entitlements and other spending programs. Their third lesson is that strong external demand is a huge help. Looking at the world economy today, the potential source of strong external demand is the rapidly growing "emerging market" economies like China, India, Brazil, and others. Finally, their fourth lesson is that it takes years to address a massive debt overhang. I sometimes think of the trajectories of U.S. government spending and taxes heading off into the future, both rising, but under current projections slowly drawing further apart. If the government can take real steps to make the rise in the spending line a little flatter and the rise in the tax line a little steeper, then the problem is gradually solved. The IMF authors look at annual deficit/GDP ratios, and find that "sustained improvements of more than 1 percentage point a year are rare." debt held by the public is at a 73% debt/GDP ratio in 2012 and is headed for a 90 percent debt/GDP ratio by 2022. To me, all of this says that the U.S. government debt burden is still at a level that remains bearable by the enormous U.S. economy. But it's high time to start making those specific medium-term changes that will keep the the U.S. 2012 episode of public debt overhang one that is short, and over the next few years turns a rising debt trajectory into a declining one.